East Front from the Outer Court, 1752. Painted by Canaletto (1697-1768). Birmingham Museum and Art Gallery. Originally uploaded by Gillian Tipson at English Wikipedia. Public Domain. I last visited Warwick Castle on a family day out in August, 2015, and have been meaning to write a post about it since then. Well, here’s the first part (it would be far too long as a single post and is likely to end up being three!). Louise – aka @afairymind – shared some of her photos from the day on her blog, ages ago. I’m just late with mine, as usual. 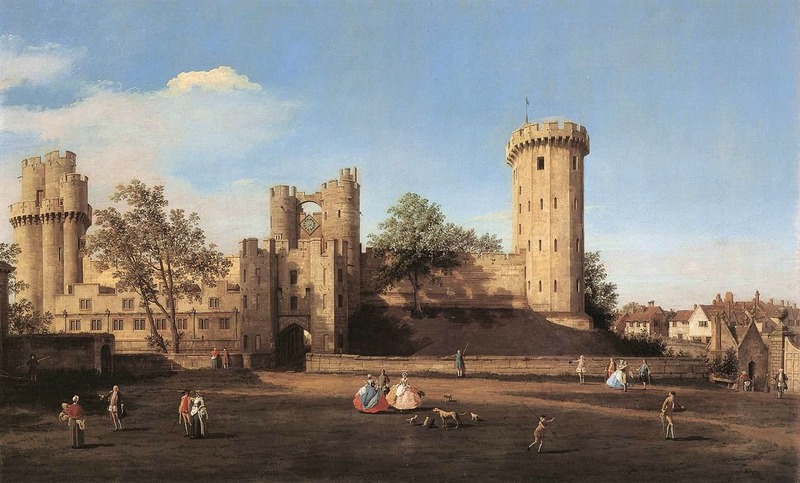 Warwick (pronounced Warrick) is one of the most famous and well-visited castles in England. It is also one of the most complete medieval fortresses in Britain. I’ve visited the castle several times, some of those with classes of Year 7 students aiming to decide how they’d attack and defend this great structure – and the weapons they’d choose to do it. But, I digress… so back to describing the place. The history of the castle site goes back to the time of King Alfred’s daughter, Aethellflaed /Ethelfleda who established a fortified burh* here – one of ten aimed at defending Mercia from invading Danes. But the actual castle came into existence following the Norman Conquest of 1066. In 1068, William the Conqueror ordered a motte-and-bailey castle* to be built on the site in order to maintain control of the Midlands as he advanced northwards. It can be seen on the plan below, labelled as the Castle Mound, and I’ll add a photo of it later, with other views from the Courtyard. Here are a few photos of the castle from the outside, which you’ll probably be able to place on the map. (Photos of the mound are from the courtyard, and are show later). The River Avon provides a natural moat to the south-east of the castle. Gatehouse and Barbican, built in the 14th century, as part of the new defensive ramparts and towers. Approaching the Gatehouse and Barbican. Bridge over the dry moat leading to entrance at the north west. Closer view of the portcullis between Clarence and Bear towers. The entrance to a castle was usually the main target for attacking forces, so it stands to reason that this should be as heavily fortified as possible. At Warwick, the barbican* (definition below and shown on the above plan) was the ‘Killing Zone’. 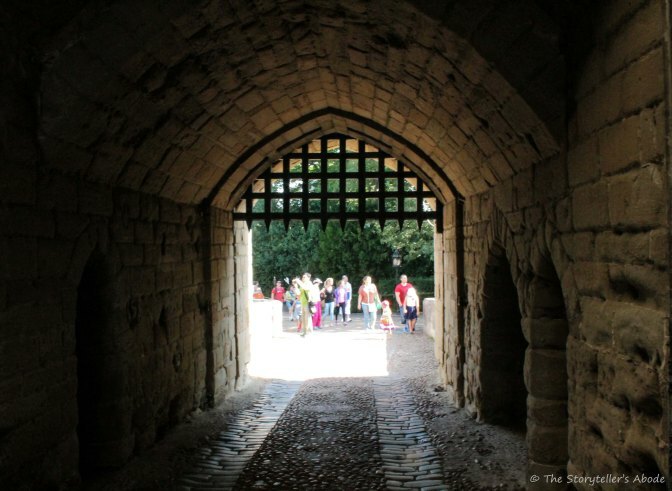 If attackers managed to get through the outer gateway – a drawbridge in earlier days, plus the portcullis, they would have to face an iron portcullis and a heavy door at the inner end as well. Once trapped in there, usually by the crush of their own men piling in from behind, defending soldiers would fire arrows and pour boiling liquids down on them through the ‘murder holes’ above. This is a photo taken inside the barbican, looking out through the outer portcullis. It’s from Louise’s collection (thestorytellersabode) from our day out. My photos were far too glary, so Lou kindly offered me hers. Following Norman times, the castle has a long history of ownership, rebuilding and extension. Although it’s interesting, I don’t intend to go into it all here! In this post (Part 1) I want to show some photos of the castle itself. The main displays to be seen in the State Rooms, and the events on that day, will be in Parts 2 and 3. The motte and bailey castle built by William the Conqueror. The original keep was repalced in the 17th century, and is the one that can be seen today. Crowds around the entrance to the castle dungeons. Caesar’s Tower behind. Guy’s Tower, added to the curtain walls in the 14th century (as was Caesar’s Tower – the earliest tower to be added. Entrance to the dungeon – a fun experience! Prisoners Walk – along which prisoners would walk o their way to the gaol and dungeon. To finish off, here are few views taken up in the towers or along the battlements. 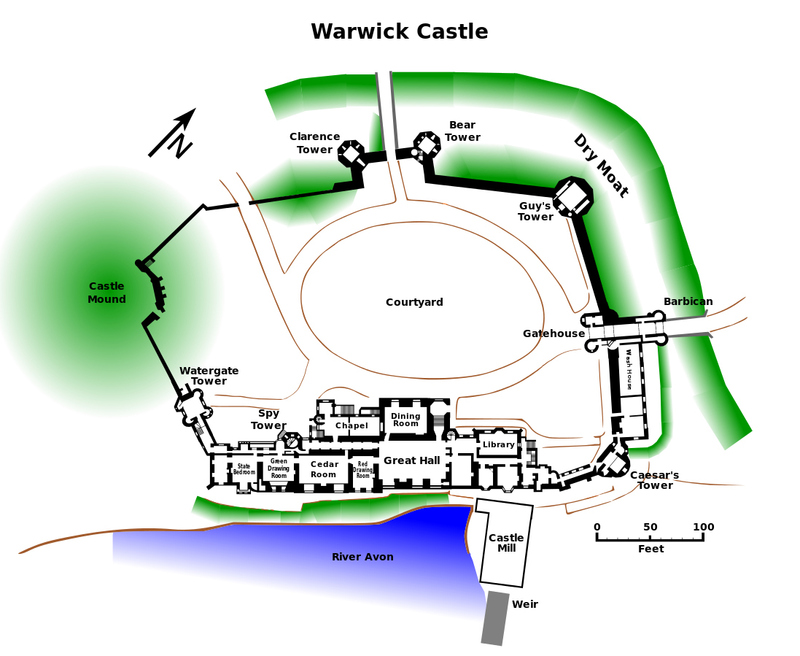 Some are of the town of Warwick beyond, others are views of the inner courtyard and buildings around it. A motte-and-bailey castle consists of a mound – on which usually stands a keep or tower – and a bailey, which is an enclosed courtyard. “A barbican is a fortified outpost or gateway, such as an outer defence to a city or castle, or any tower situated over a gate or bridge which was used for defensive purposes.” Definition from Wikipedia. Those terms certainly leave little to the imagination! 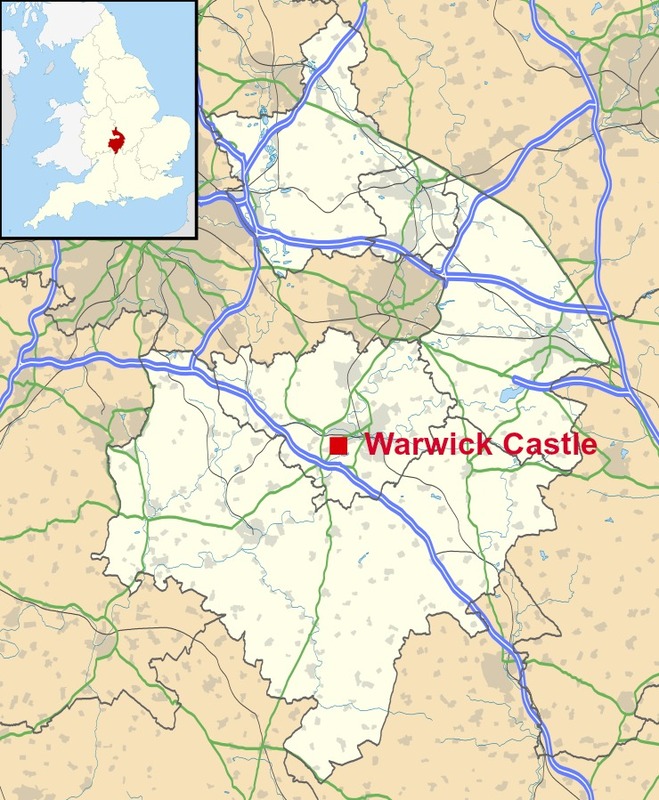 🙂 Warwick is a great castle, and has been relatively well maintained over the centuries because it’s been lived in. Nor was it slighted after the Civil War as it was already held by parliament. Thanks, Ali. Lovely post. It’s an impressive fort that is built so well. Thank you Arv. Yes, Warwick has had strong walls and towers added to it over the centuries – not to mention the barbican. It was an impressive fortress in its day and not one the fainthearted could attack. It’s certainly makes us asks so many questions on technology available in those times and the foresight of the people and rulers. It is an interesting part of history of human race. I adore castles and we spend a lot of time visiting them – even when we’re abroad. There are some great ones around Europe, I’ve got a lot still to write posts about, but goodness knows when I’ll find the time! Lol Thanks for the lovely comment. Especially like the pic with the castle and the river. Great post. It’s a pretty view of the river and castle from the east, Peggy. The joust we watched was held a little further from the river on that side. It made a great setting. Glad you liked the post. I only intended to write one, but it’s somehow evolved into three. What a wonderful place — I would love to visit there! That’s an impressive barbican, too. But I’m confused: why build such serious fortifications at the front door and then leave the back and side doors barely protected? Seems like that wouldn’t fool an invader for long. Did they explain anything about those other entrances on your tour? We didn’t go on a tour on this occasion Joy, and there weren’t any (apart from round the dungeons) while the events and activities were on for the summer. You’re right about the fortifications, although the defenders inside wouldn’t have left the back and sides undefended. There was a moat all round, for a start – the river on the east side. For several years I taught at a school where all of Year 7 (almost 200 of them) had a day trip to Warwick castle. We, the teachers, did the guided tour round the different gateways and walls to look for the strongest and weakest entry points. It isn’t too hard to see that you wouldn’t attack the barbican, as you say. The west gate is a weak point, with a single portcullis today – although it may well have had a drawbridge in the past. The walls are lower there too, for scaling. The students drew sketches and took photos, viewed siege weapons and so on, and most would produce excellent, long pieces of work, analysing the best methods and places for attack and how the castle should be defended from the inside. All the towers and walIs had machicolations, and arrow slits, too, so arrows would rain down on attackers. I suppose a barbican at the front gave those inside peace of mind that getting through that, at least, would be well nigh impossible. But even there they had a second lot of gates and portcullis, and the murder holes, just in case attackers got though the outer drawbridge and portcullis. It’s a fascinating topic to study, particularly in relation to the really big castles. I would have loved to go to a castle and figure out how to attack it when I was that age. Or my current age, for that matter! And yes, I’m still awake – but then, I’m quite a few hours behind you in CA, so it’s barely dinner time over here! Lovely, wish I could have been there too! Yes, castles are lovely places to visit – so full of atmosphere. I love the old, ruined ones probably more than I like the really well maintained ones like Warwick. Plenty of ghost stories around, too. I know you’d love to see all of them, Timi. Perhaps one day you’ll visit, who knows? We’ll definitely make that a date, Timi, but I’m guessing it won’t be this year! With your trip to Iceland, and your umpteen courses, I’ve a feeling 2017 is already well filled up. We’ll be going to Malta in June and Ireland in September (date for that yet to be arranged). Then we’ll have other little breaks around Britain. I haven’t been able to get into my blog properly for days, so it was a good thing my Warwick posts were all scheduled to go. The internet is always dodgy in this village, and this week it’s been more off than on. I’ll hop over to see what posts you’ve done recently as soon as I can. Hope you enjoyed your blogging break. You didn’t seem to be gone for long. Both of those posts promise to be excellent, and I’ll definitely read them if our internet behaves itself! I’m attempting to write an awards post (or three) right now. I have seven different ones to do, so I won’t fit them all into one post. I’ve been sitting on some of them for months. I follow so many people whose blogs are ‘award free’. I did intend to to make mine the same, but haven’t got round to it yet. I’ve been trying to do more on my latest awards post today (Saturday) and finding enough nominees for 7 awards is almost impossible. I can see why many people have an ‘open’ nomination to all their followers. But, I’m not sure whether anyone would actually take up that offer. Just a warning – I’m nominating you for one, but there’s no obligation to accept. A couple I’m doing don’t require facts giving or questions answering and just ask for nominees. Look for a post to come soon on my blog about the Vikings exhibition I attended last weekend with friends…. Very interesting and lovely! Thank you, for sharing. You’re welcome. I’m glad you enjoyed the post! What a fun day you had spent there, Millie. Glad you finally shared all the amazing photographs. My photos are nowhere near your standard, as I’m no photographer. But I like to add photos to let people see as much of these places as possible (the reason my media file is almost full again. I’m about to upgrade very soon).